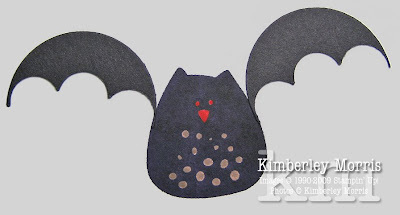 As I was putting away the kitty card I made for the previous post, I realized you can also make a bat with the owl image in the Animal Stories stamp set (available for purchase July 1st!). All I did was stamp the owl in Basic Black. Then, I took a scrap piece of Basic Black card stock and took a "bite" out of it in two places with the Scallop Circle Punch. Then I lined up the 1" Circle Punch over 3 of the scallops in one of the "bites" I had taken out of the Basic Black card stock, and then punch to get a wing shape that is rounded on top, and reverse scalloped on the bottom. Line up the 1" Circle Punch over the second "bite" area in the same way, and you have your two wings! Glue the wings alongside the owl body in whatever position you like. I used the Two-Way Glue Pen because it's quick and neat, and I can easily use just the very little amount of glue I want. Then, take a Close to Cocoa marker and fill in the spots on the owl. Color in the "beak" and eyes with a Real Red marker, and you're done! If you're really good, you might be able to add in a couple of white fangs over the red mouth...but I don't have time for that just now! I can see this on a card front, with maybe some Rich Razzleberry sponged clouds behind it, and the "happy halloween" greeting from the Teeny Tiny Wishes stamp set, on the Modern Label Punch. I'll have to give that a shot for tomorrow's blog entry! 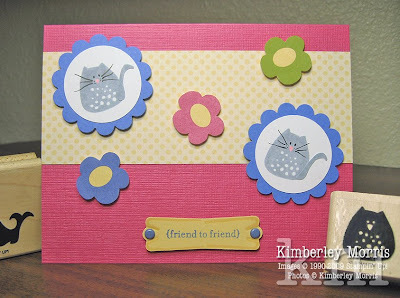 This card was made with a Sneak Peek stamp set, called Animal Stories. The set is a Sneak Peek because it will be in the new catalog, which will be unveiled July 1st...but I got to preorder the stamp set as a Demonstrator! There are 4 stamps in the set, a whale, a giraffe, an owl, and an elephant. So, you may be wondering how I got a kitty out of the set. Honestly, a kitty was the first thing that came to mind when I saw the picture of this stamp set. If I didn't have my sweetie, my kids, and my stamps to keep me entertained, I'd probably be a CCL (crazy cat lady). It wasn't hard at all to make the kitty. I just stamped the owl, and then the tail of the whale, in Brocade Blue, and then used my handy-dandy Paper Snips to trim off the last swirl of the whale's tail to use as the cat's tail. I then colored in the nose with a Pretty in Pink marker, and made whiskers and colored in the eyes with a Basic Black marker. You can actually draw little triangle shapes down the side of the inked up owl, with a darker colored marker, and then stamp, to get a stripey cat--it turns out way cute! Use different colored markers to make a tortoise-shell or calico cat. For those of you out there who just don't like to, or can't, cut the little strip of whale's tail out, you can still make a kitty by using the brush end of a coordinating marker and just drawing it on. The tag on the card was also made from Sneak Peek product--it uses the Modern Label Punch. Believe me, you're going to see this punch everywhere, and you will HAVE to have it on July 1st. In fact, you might want to order it as soon as you can (Noon MST on July 1st) so you don't risk waiting for it on backorder, because I'm sure it is going to be a big hit with everyone! I took a VersaMarker and drew around the inside of the tag, to make it look a little more 3-D, and I even added a couple of score lines around where I put the brads. It gives the label a lot more depth...or at least it seems that way to me. The Designer Series Paper (DSP) I used in the background is called Tall Tales, and the images on many of the sheets coordinate with the Animal Stories stamp set. The flowers on my card came from the flip side of the So Saffron sheet I used from the Tall Tales DSP package. I used those wonderful Paper Snips again, to trim them out. 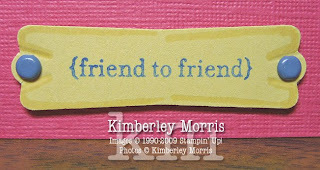 I stamped a greeting from another Sneak Peek stamp set, called Teeny Tiny Wishes, on the tag. I used Craft ink to stamp this in Ballet Blue, so that it would be opaque, and the color of the ink would remain true instead of soaking in and mixing with the card stock to take on a greenish tint. 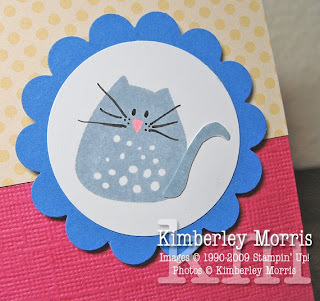 Stampin' Supplies: Animal Stories stamp set*, Teeny Tiny Wishes stamp set*, Melon Mambo (8-1/2"x11") Textured card stock*, Tall Tales DSP*, Modern Label Punch*, 1-3/8" Circle Punch, Scallop Circle Punch, Ballet Blue card stock and Craft Ink, Whisper White card stock, Brocade Blue ink pad, Basic Black marker, Pretty in Pink marker, 1/16" hole punch, Rich Regals Brads Asst. (Brocade Blue), VersaMarker, Paper Snips. *THESE PRODUCTS ARE NOT AVAILABLE FOR PURCHASE UNTIL JULY 1ST! 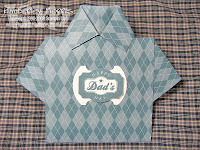 Sorry it's been so busy around here for me to post much of anything new, but I wanted to share three previous Father's Day projects I posted--in case you can still make use of them this year. All three projects are available with full tutorials! Links for each of the projects are included below the pictures. Wow, Summer is finally underway here in Colorado Springs--for so long it was cold and rainy like spring, and we even still have a little sprinkling of snow up on Pike's Peak! But the last few days have at least been seasonally accurate, and it's time to refill the propane tank for the barbeque grill. How about making your Fourth of July celebration a little more crafty this year? The guys get the grilling, the kids get the water fights, and you're stuck with all the setup and takedown cleaning--hey, wait a minute, where's your fun? You can do a million and one things with this Kit, but check out the special article HERE to see how you can make a paper bowl for your dry snacks (popcorn, pretzels, chips) with the Food Wrappers, and how you can make a darling festive centerpiece with some leftover pieces, plus a few simple extra products like glitter and brads. You can order the Country Living Cookout Kit anytime at my ONLINE STORE, and have it shipped directly to you. Or, you can drop me an email, or give me a call at 719-205-5957 to have me order it for you! Calling or emailing works out the best if you're looking for more ideas, and/or want suggestions for coordinating add-on product! EARN UP TO $40 IN EXTRA HOSTESS FREE STUFF! 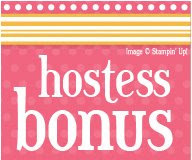 During the month of June, Hostesses can earn up to $40 in additional FREE HOSTESS DOLLARS! Please email me right away if you'd like to get your workshop booked this month, or give me a call at 719-205-5957. You can have an in-home workshop (at your home or mine!) in the Colorado Springs area, or just pass the catalog around to gather orders. If you do an in-home workshop, I'll show you a little sneak peek at the new catalog and some new products...and as a special Hostess Gift, I'll give you a sampler of the 6 new In Colors, including textured card stock, markers and coordinating ribbon!!! Q: Will a hostess get $80 in hostess free merchandise dollars for hosting an $800 workshop? A: No. Awards amounts do not increase above the $400 workshop mark. Q: Will customers who purchase the qualifying hostess amounts in the Online Store also receive additional hostess free merchandise dollars? A: Yes. Customers who purchase $250-$399.99 in the Online Store will receive an additional $20 in hostess free merchandise dollars, and customers who purchase $400 or more in the Online Store will receive $40 in hostess free merchandise dollars. Q: Do the qualifying hostess amounts include tax and shipping? A: No. Hostesses must meet the qualifying amounts before tax and shipping. Q: Can hostesses use their additional hostess free merchandise dollars on products in the Occasions Mini Catalog? A: Yes. Hostesses can use their additional hostess free merchandise dollars on products in any current catalogs, including the Occasions Mini Catalog and the Spring-Summer 2009 Idea Book & Catalog. Out with the Old, In with the New...again...! 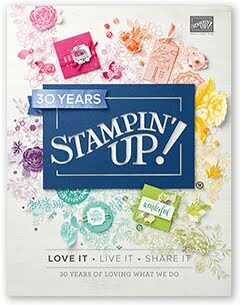 It's almost that time of year again...time for a new Stampin' Up! Idea Book & Catalog! The new catalog will be available for ordering on July 1st. If you would like to purchase a copy, email me and I'll mail it to you for just five bucks! As a special offer from me--you can purchase any of the Stampin' Up! Retiring Stamp Sets during June, at 15% OFF! You can SHOP ONLINE anytime, and still receive my personal specials via rebate check. 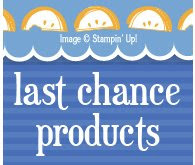 For example, if you purchase Retiring Stamp Sets online, I will send you a rebate check for the 15% Off special.